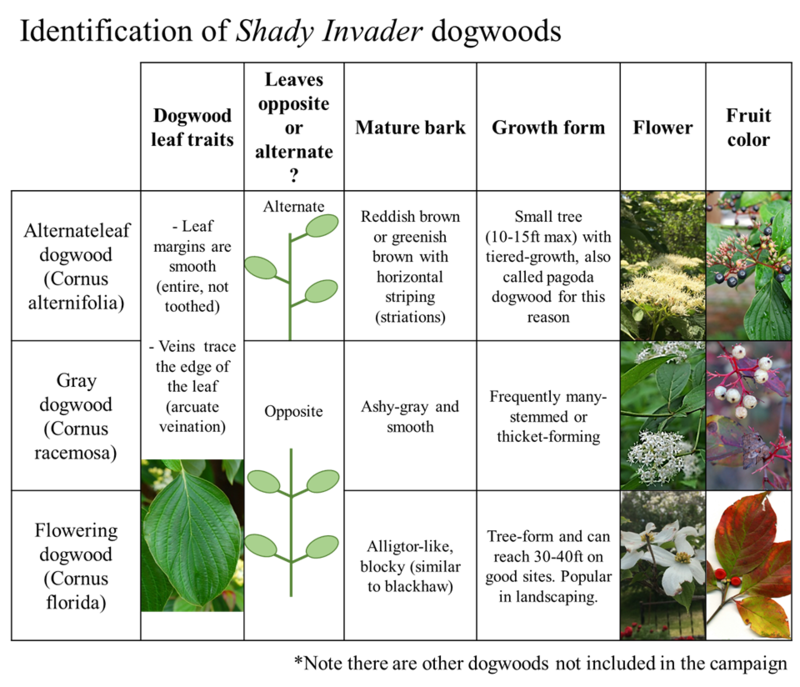 Here are some photos and tips to help you identify the invasive and native shrubs that we ask you to observe as part of the Shady Invaders campaign. 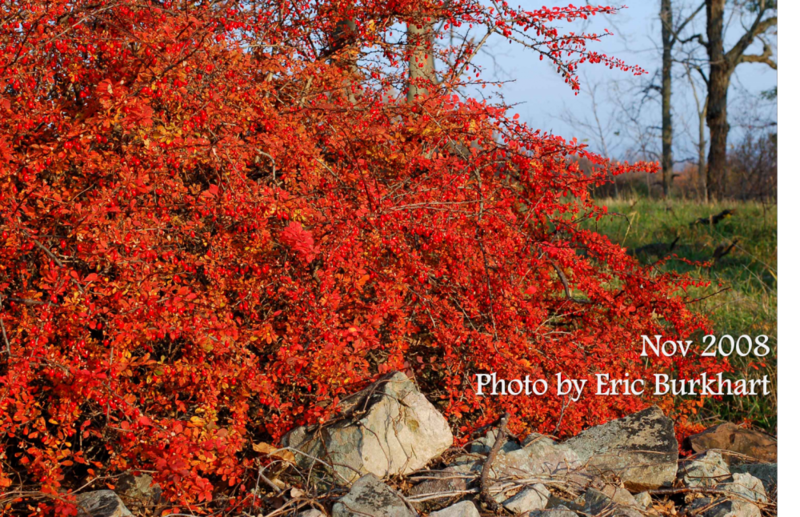 Japanese barberry (Berberis thunbergii) has bright red foliage in fall. 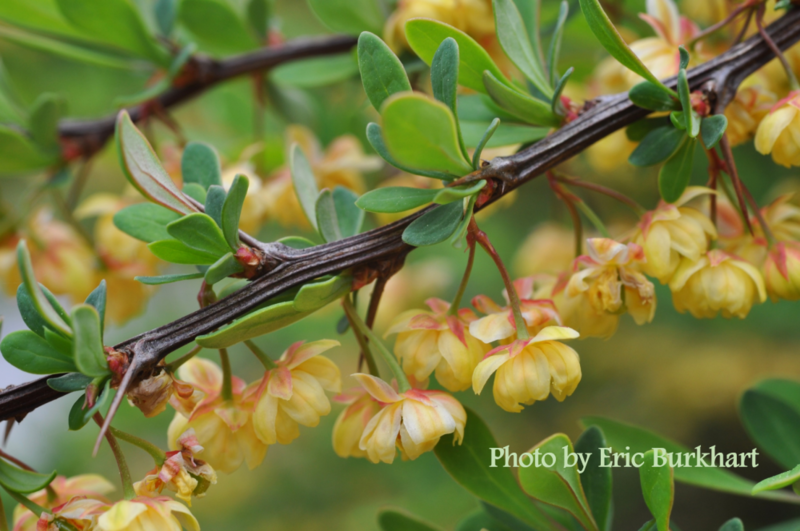 Note that there is also a cultivar of Berberis thunbergii that has purple foliage all year round. 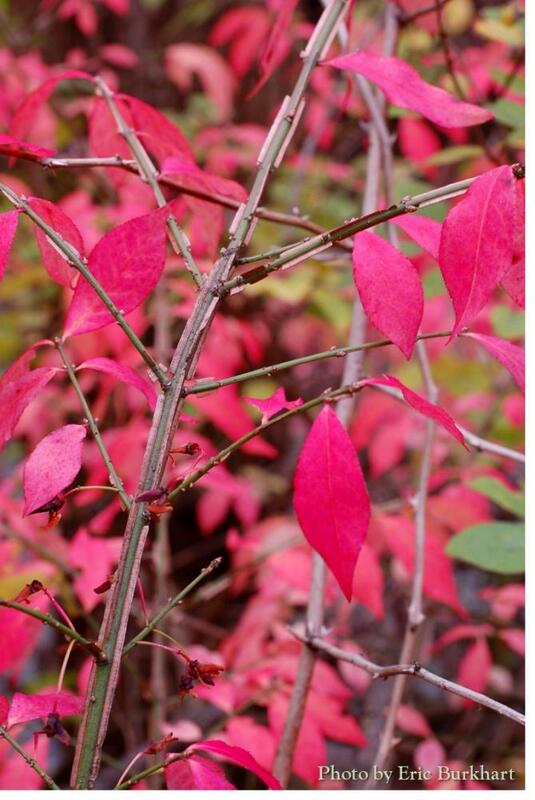 This is not considered fall foliage. 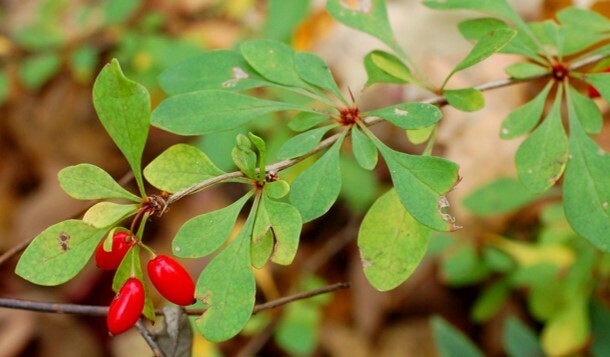 Burningbush (Euonymus alatus) has green leaves that change to bright pink and red in the fall. 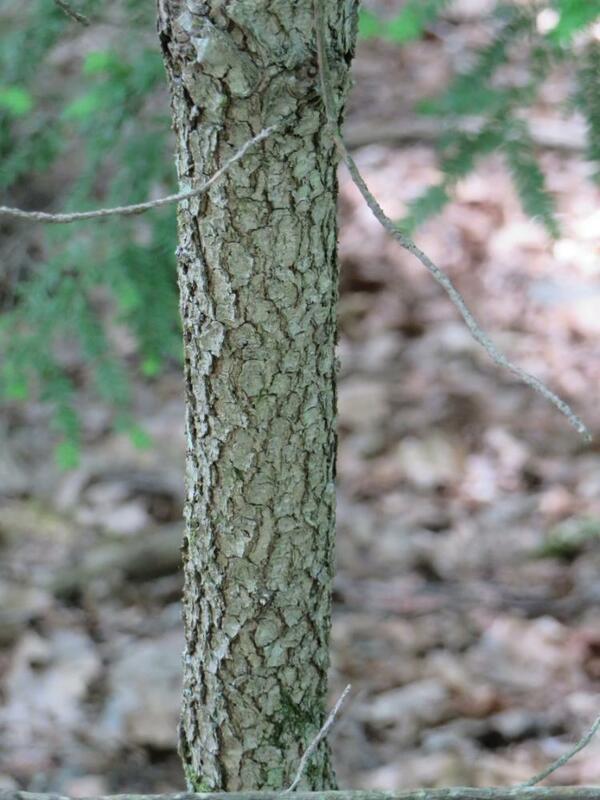 The leaves are in opposite arrangment, meaning they are on opposite sides of the branch as opposed to alternate. 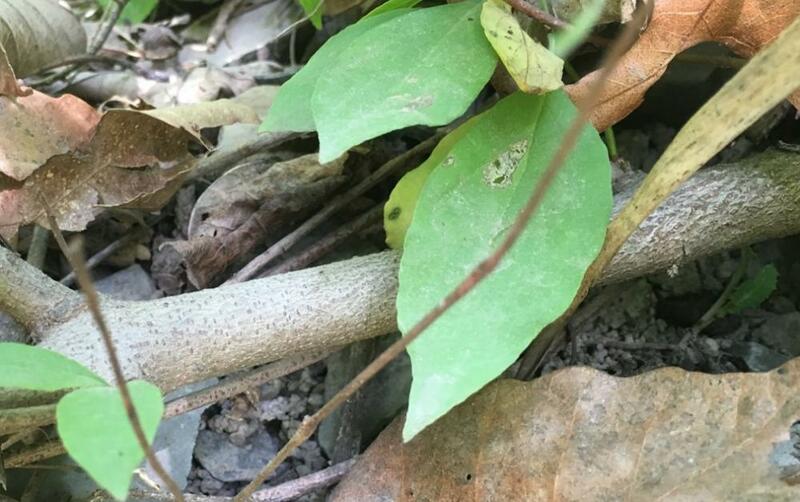 You can see the strips of thin corky-bark, called wings, along the stems. 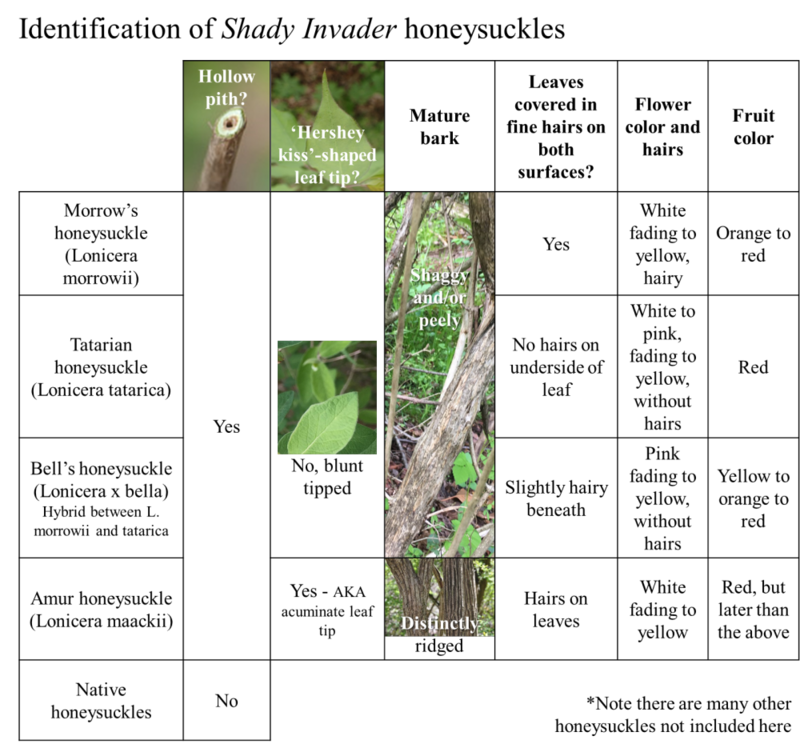 The wings are not apparent on all specimen, but usually you can find wings somewhere on a plant, which helps with identification. 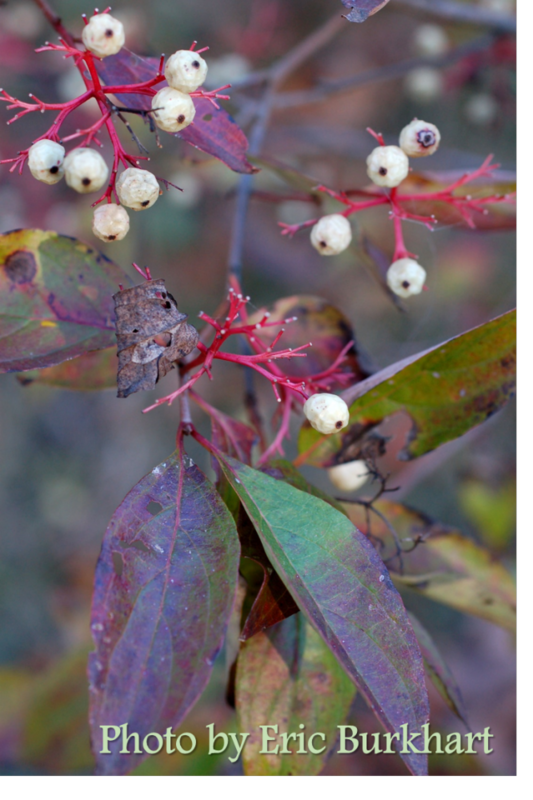 No other shrub with opposite leaves should have these wings. 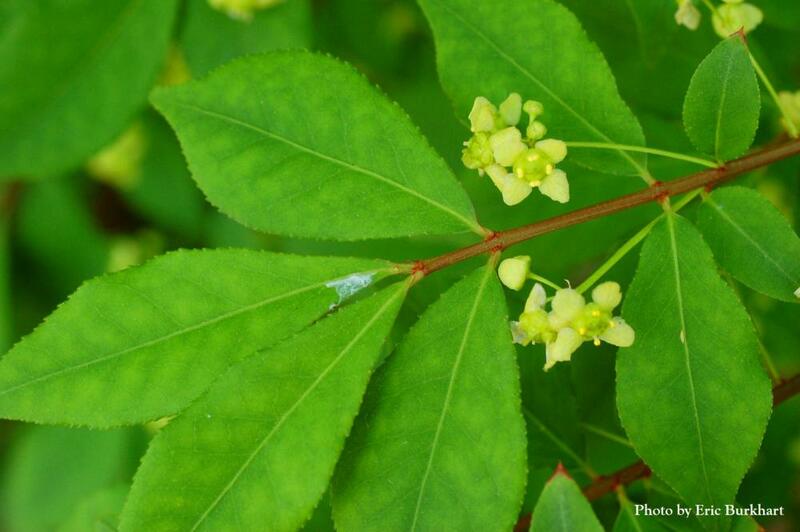 Burningbush (Euonymus alatus) non-showy flowers appear in early spring. 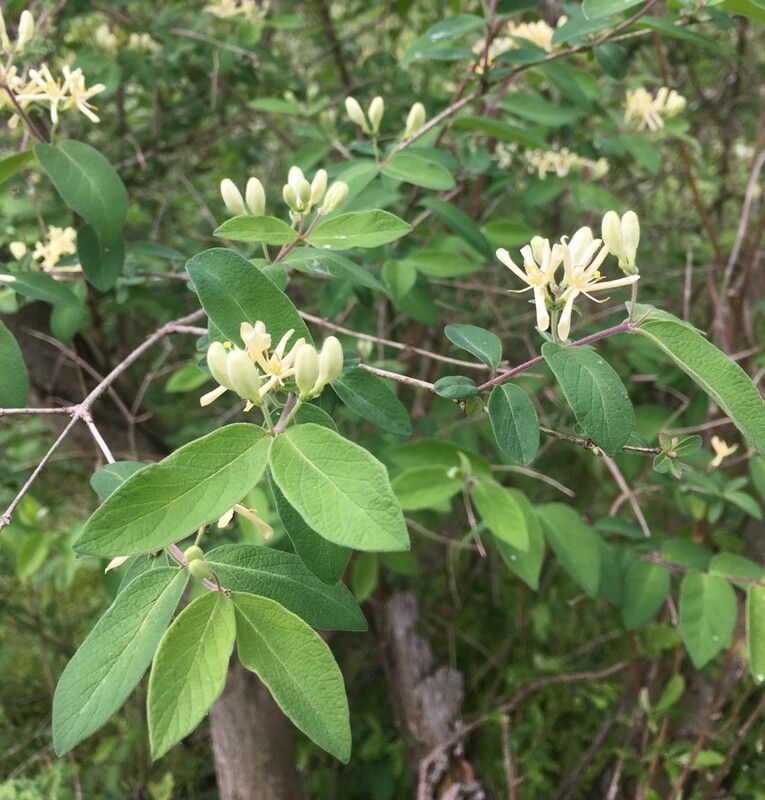 This photo was taken in central Pennsylvania in May. 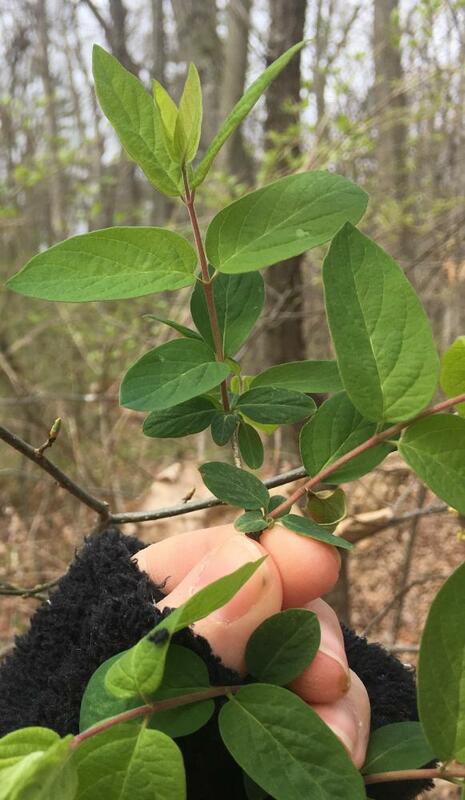 Note the relatively blunt serrations (knife-like edges) on the leaf margin, unlike the entire margin (smooth edges) on privet. 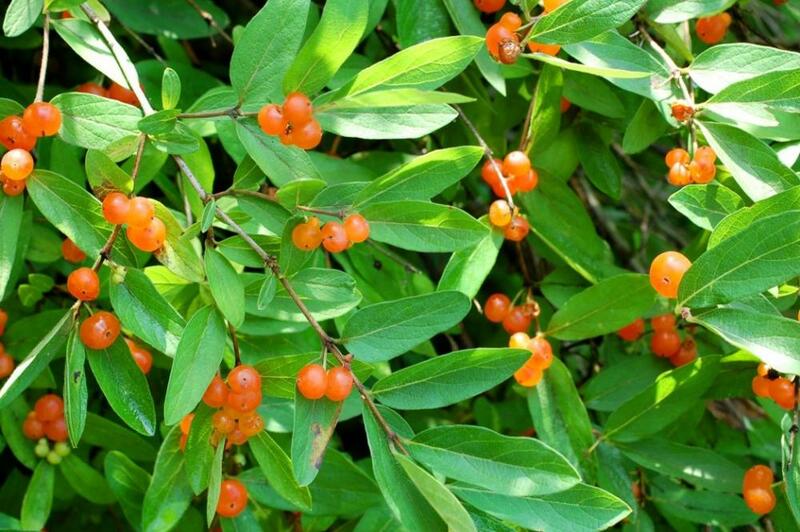 Burningbush (Euonymus alatus) unripe fruit. 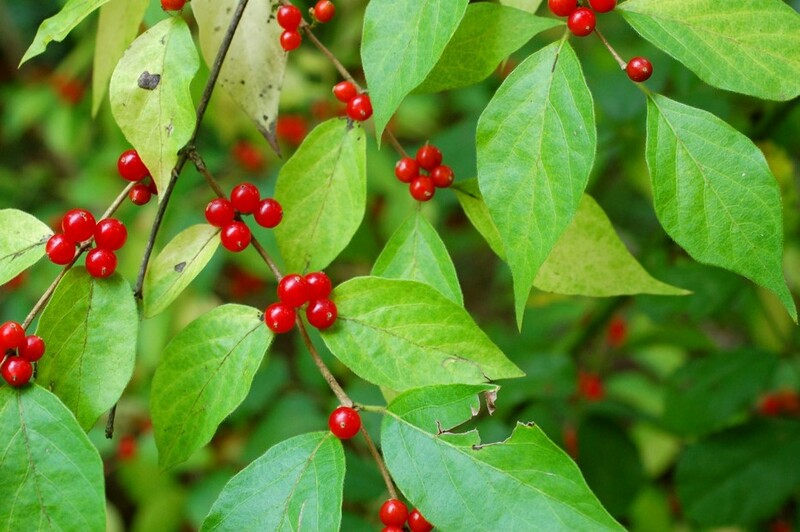 In more northern regions of the US, these unripe fruit are usually seen late summer or early fall. 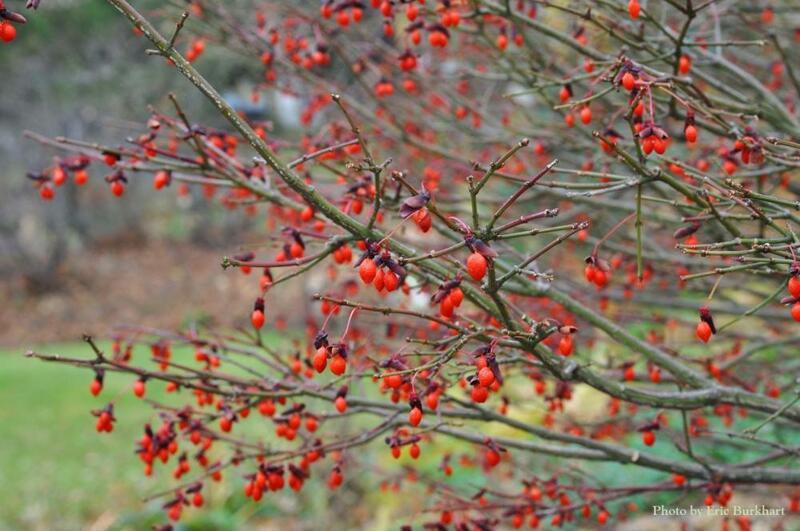 Burningbush (Euonymus alatus) ripe fruits. After the leaves have fallen, the bright fruit will still persist. 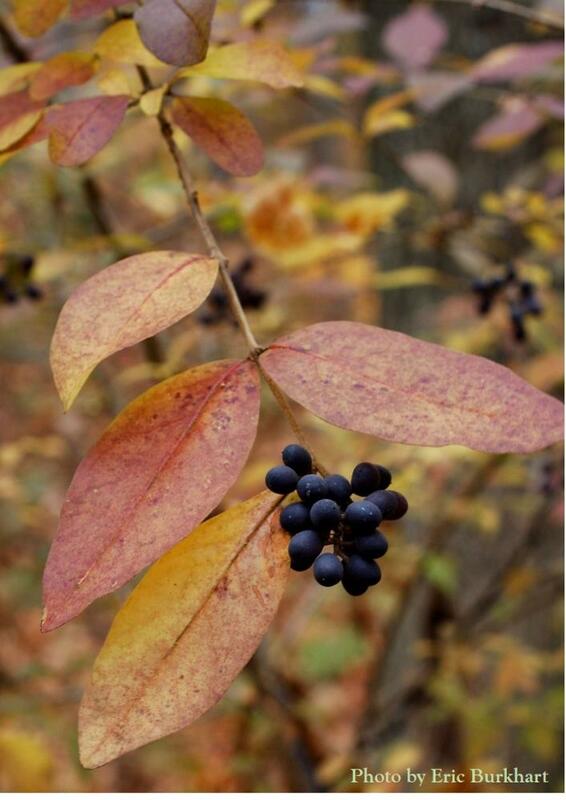 This photo was taken in November in central PA.
Privet (Ligustrum spp.) 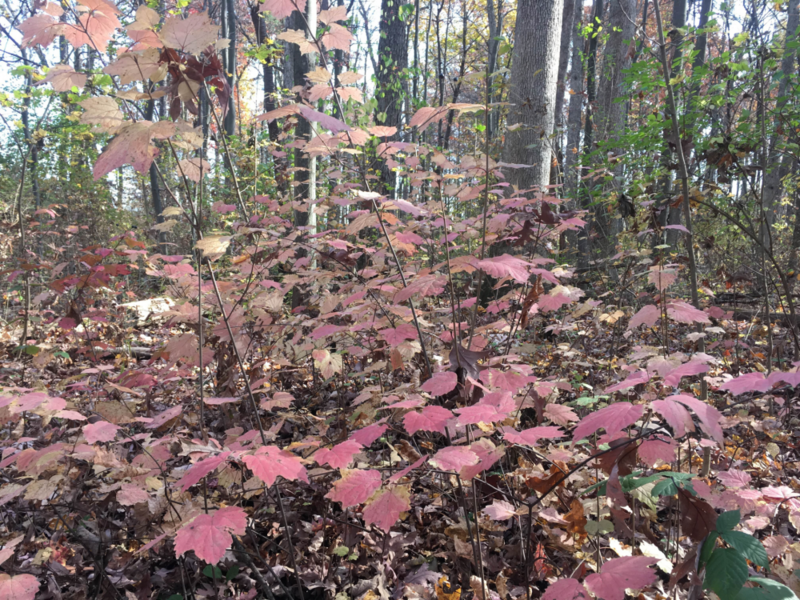 can form a dense thicket in the understory of a forest. 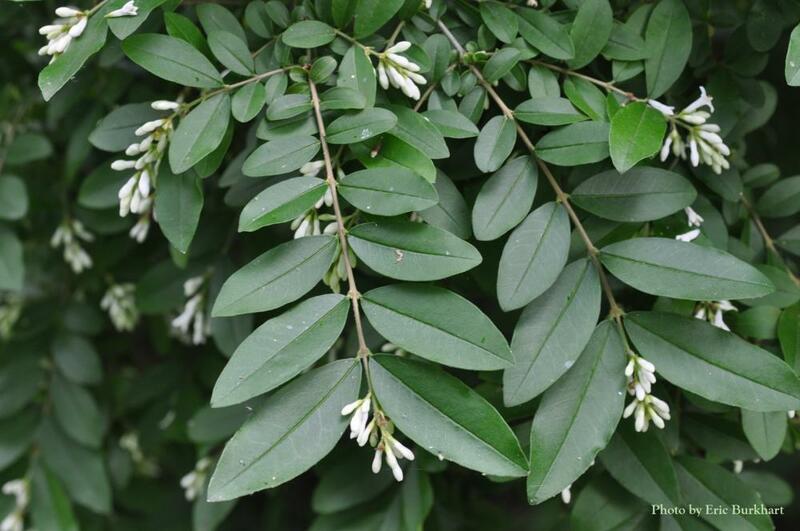 Privet (Ligustrum spp.) 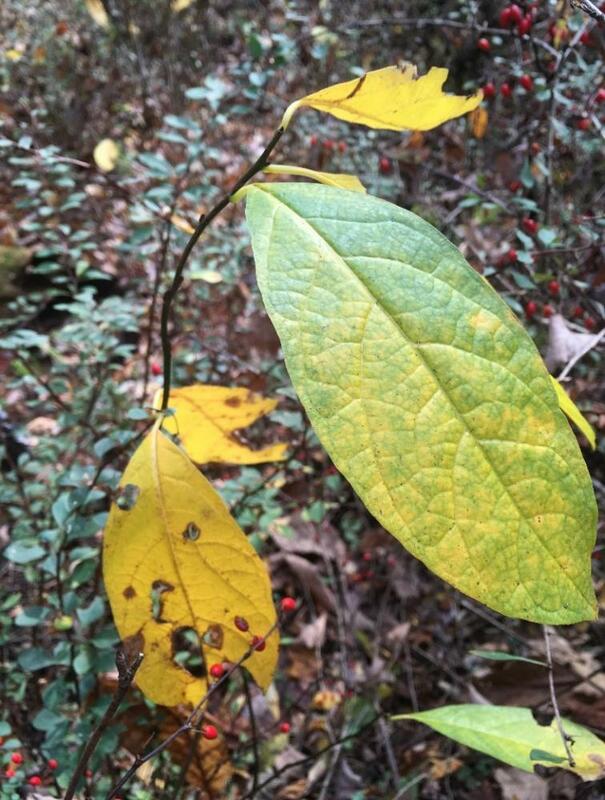 leaves have an opposite arrangement, with leaves coming off the stem on opposite sides. 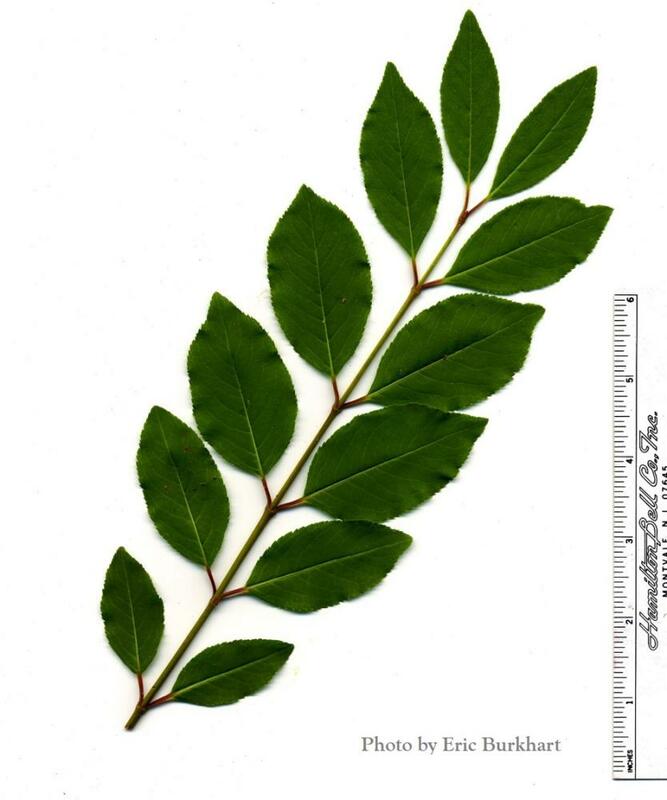 Privet (Ligustrum spp.) flowers and fruit arise at the ends of the branches. 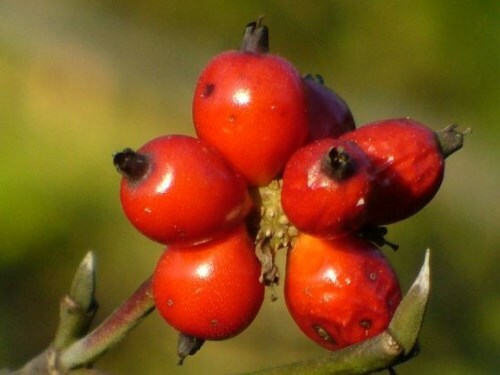 They flower in early summer, and shortly after form unripe, green fruits. 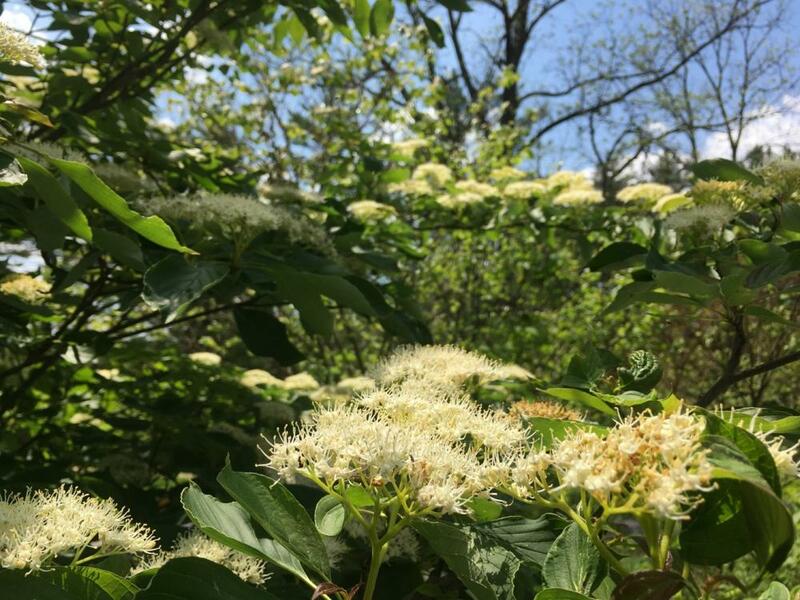 This photo of the plant flowering was taken in June in central PA.
Privet (Ligustrum spp.) 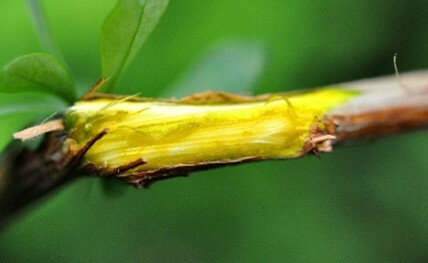 unripe fruits, at the ends of the branches. 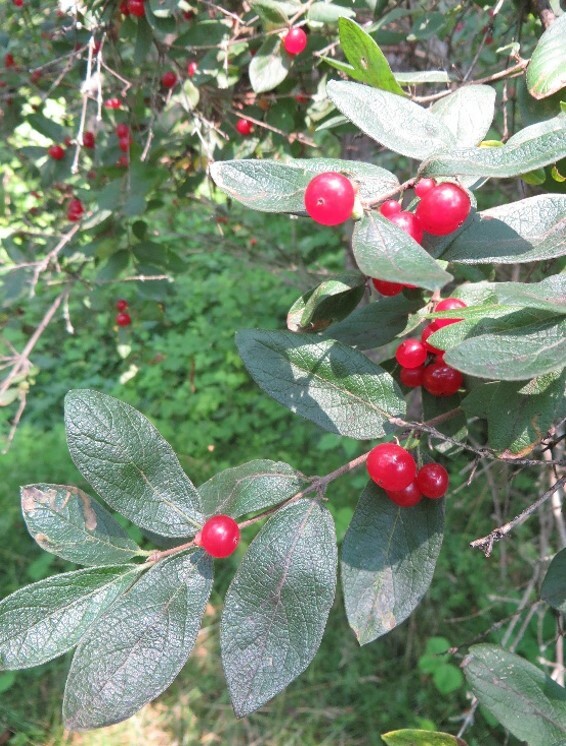 This plant will flower and fruit even in the dense shade of the forest understory. 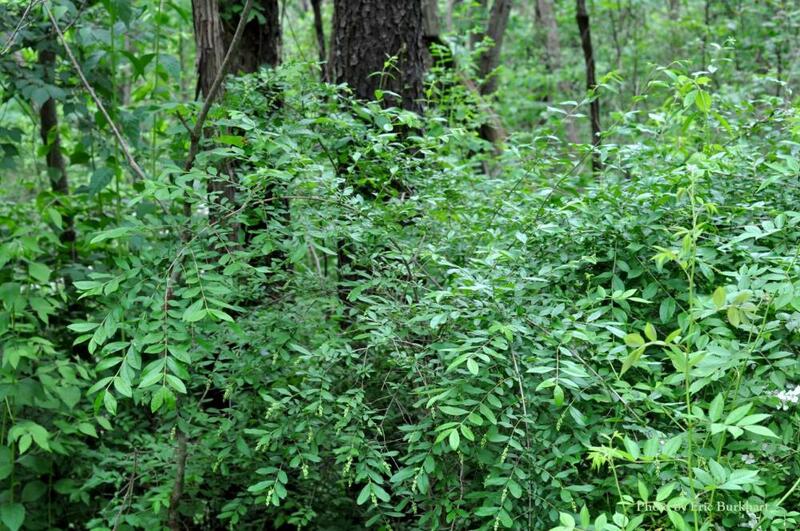 Privet (Ligustrum spp.) fruits ripen to a dark purplish-blue-black. 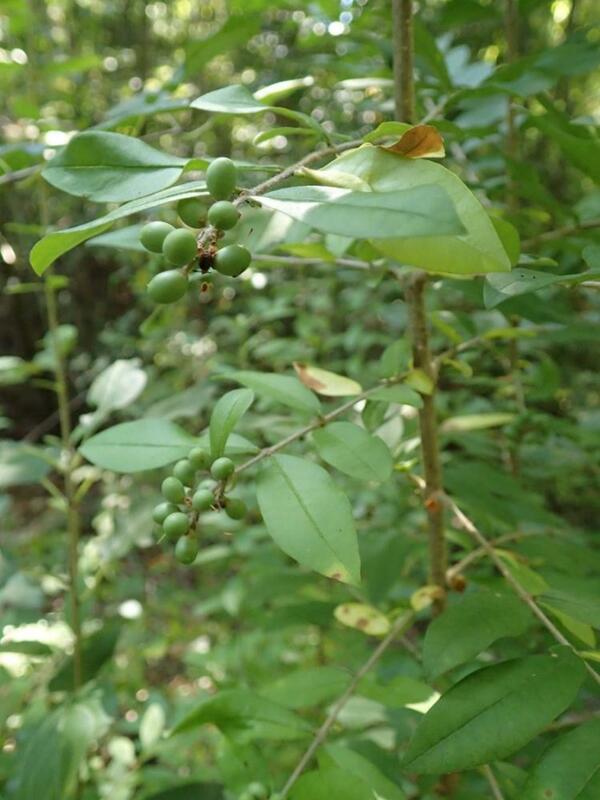 Athough fruit ripens in late summer, you can find ripe fruit still attached to Ligustrum well into the winter. 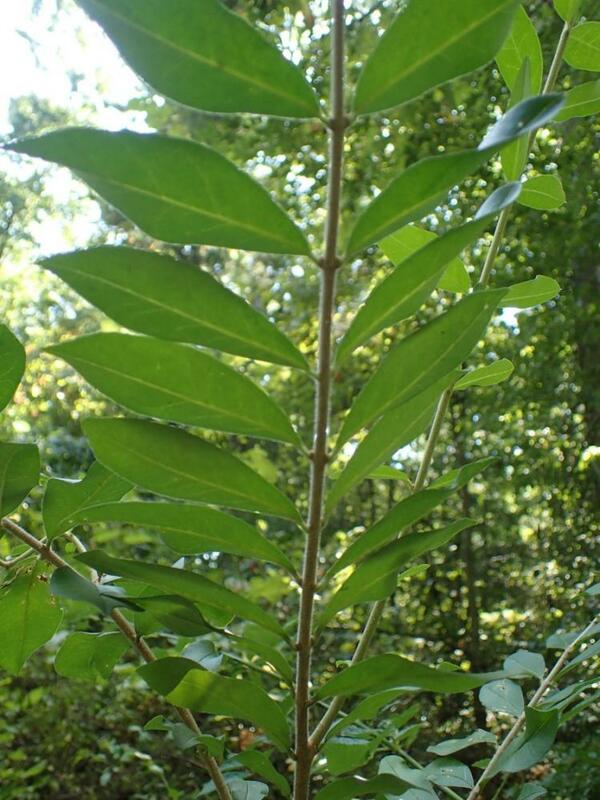 Remember, we are interested in shrubs under a deciduous forest canopy. 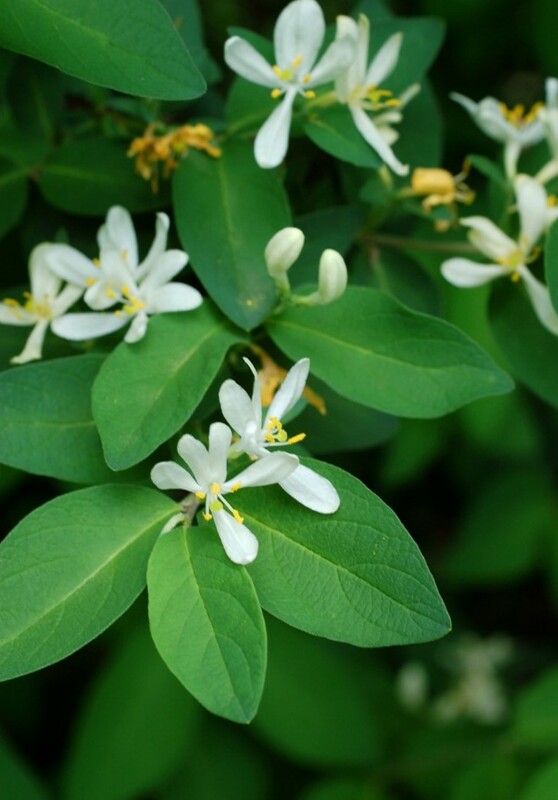 However, some honeysuckles are actually vines, which don't stand upright without support (they lack sturdy woody stems). 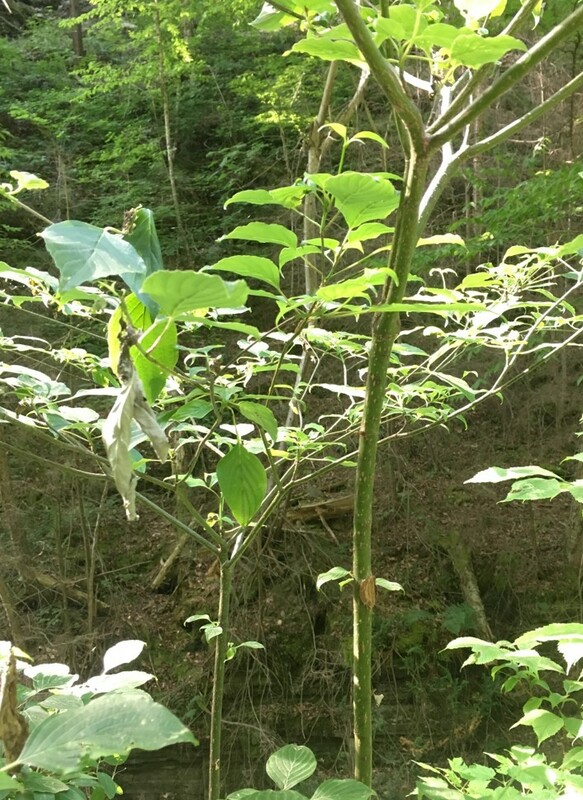 *Note that this species commonly hybridizeswith Tatarian honeysuckle (Lonicera tatarica) to form a separate species, Lonicera x bella. 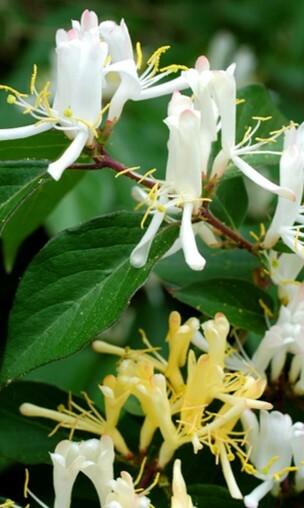 *Note that this species commonly hybridizeswith Morrow's honeysuckle (Lonicera morrowii) to form a separate species, Lonicera x bella. 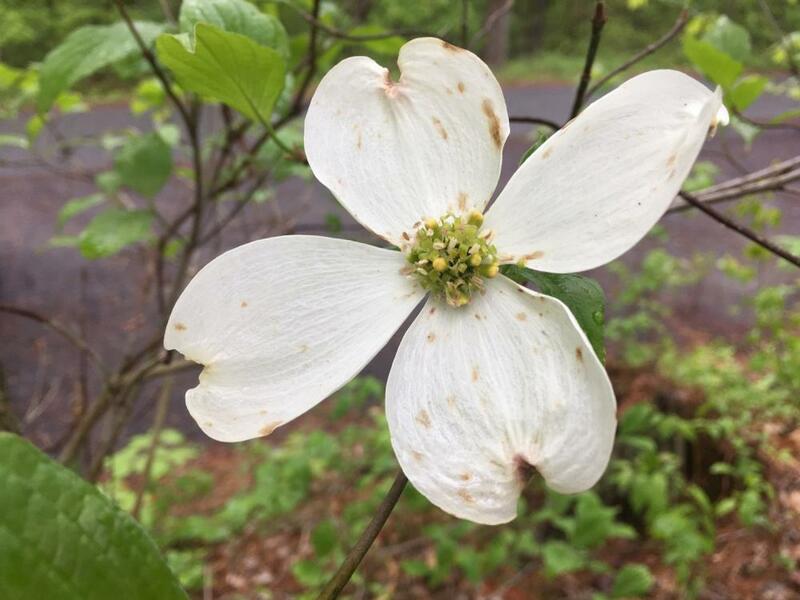 Flowering dogwood (Cornus florida) open flowers. 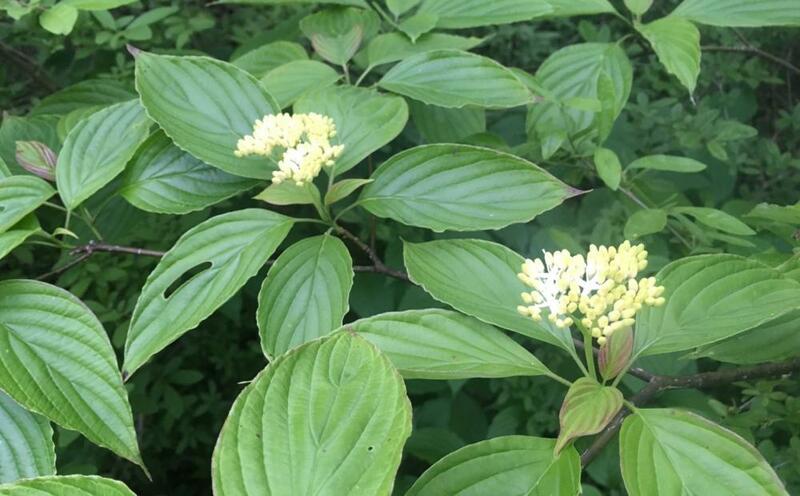 Note that flowers are the small cluster of yelow flowers in the center of the four large white bracts. 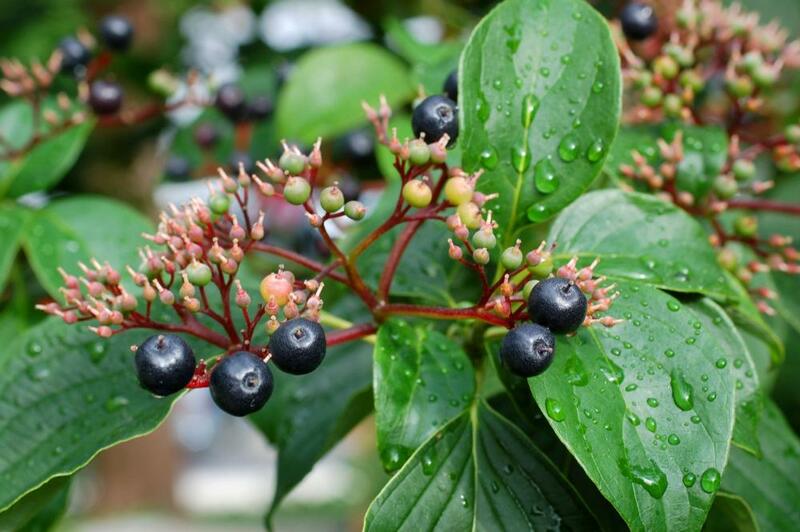 Flowering dogwood (Cornus florida) ripe fruits. 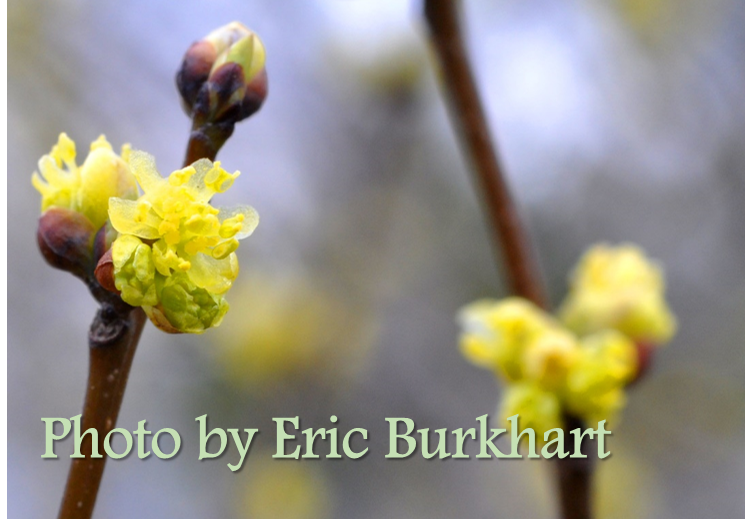 Black haw (Viburnum prunifolium) breaking leaf buds. 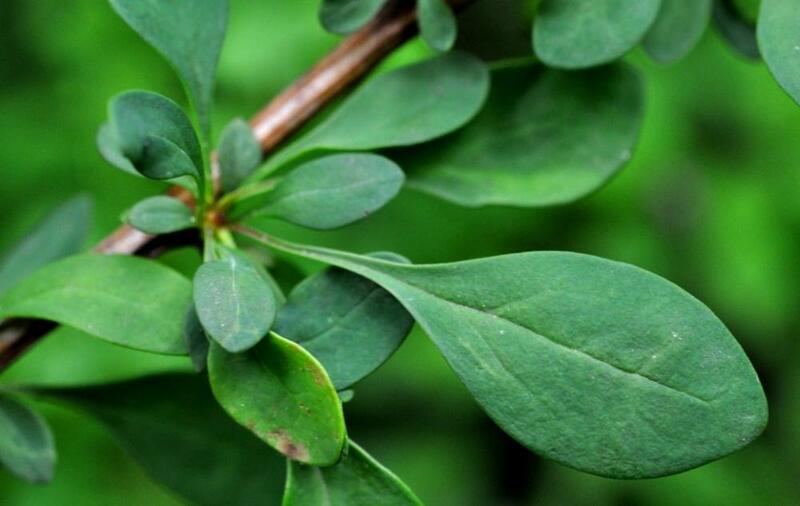 Ignore the bud-scale leaves, which enclose the bud but are not true leaves. 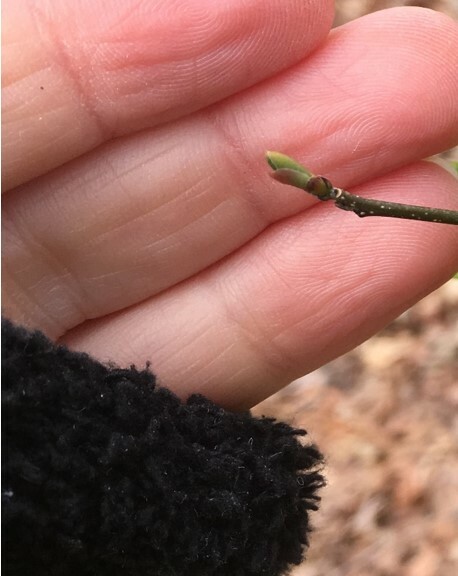 Once the bud-scale leaves separate to expose the true leaf tips, as in the photo at right, report breaking leaf buds as "yes." 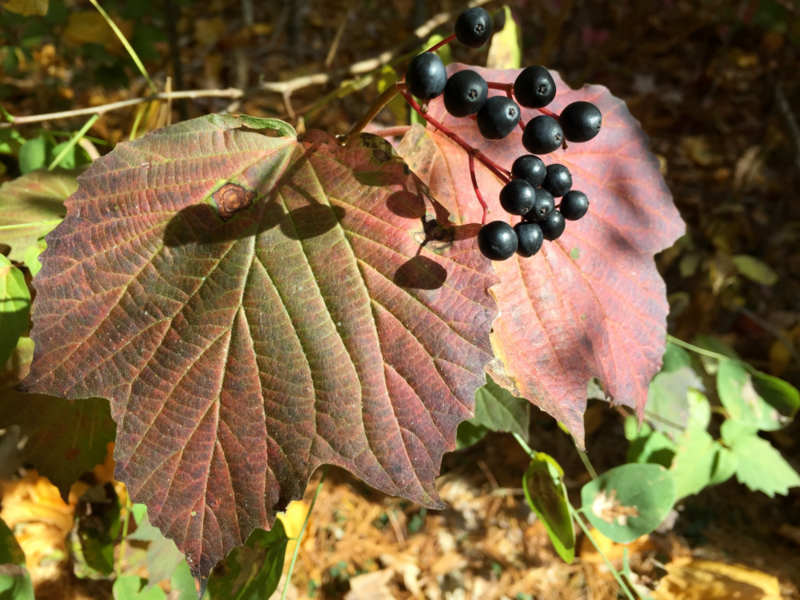 Black haw (Viburnum prunifolium) leaves. 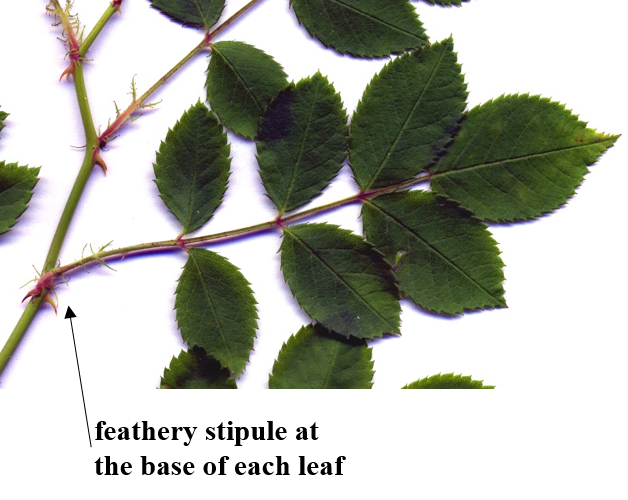 The epithet ‘prunifolium’ can be broken down into:pruni-Prunus is the genus of cherries-folium referring to foliage or leaves. 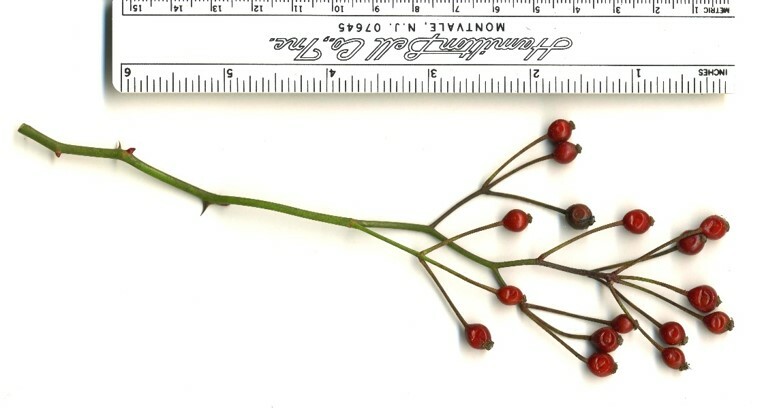 The leaves of this plant resemble cherry, except that they are oppositely arranged instead of alternately arranged along the stem like cherries. 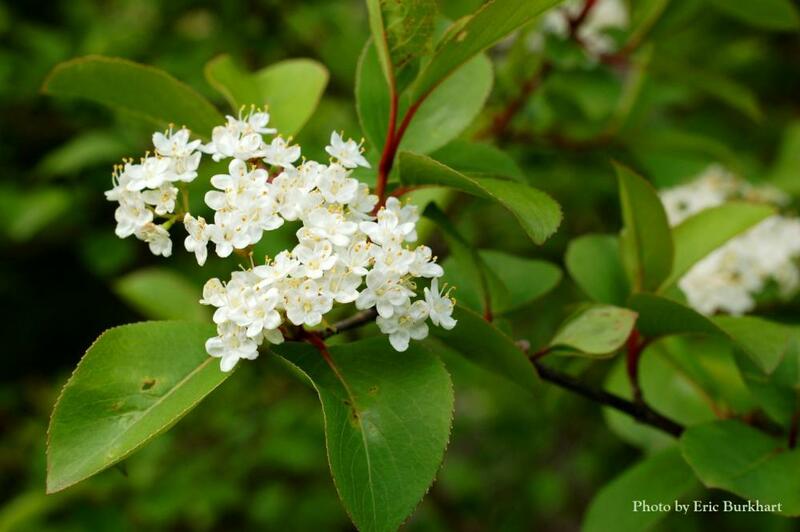 Blackhaw is also sometimes confused with dogwoods, although the leaf margin of blackhaw is serrate or toothed, while dogwoods have entire margins that are smooth along the edges. 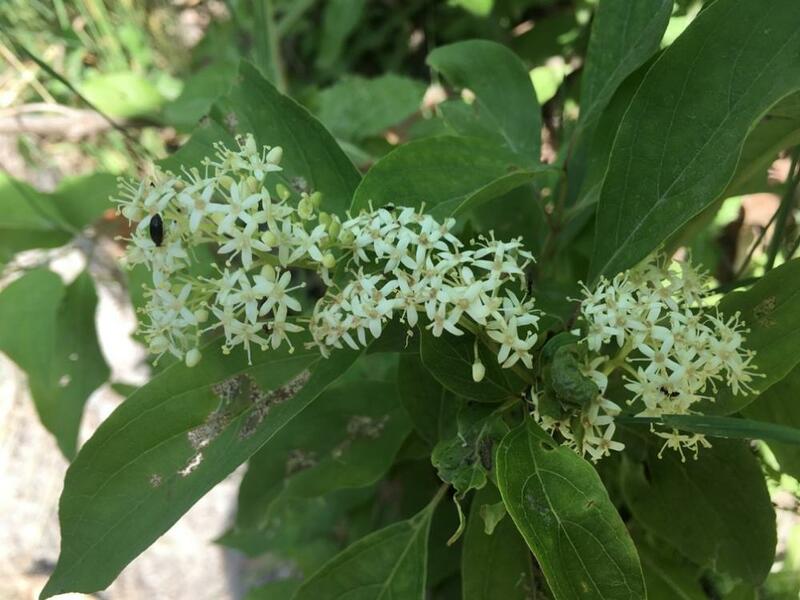 Black haw (Viburnum prunifolium) flowers. 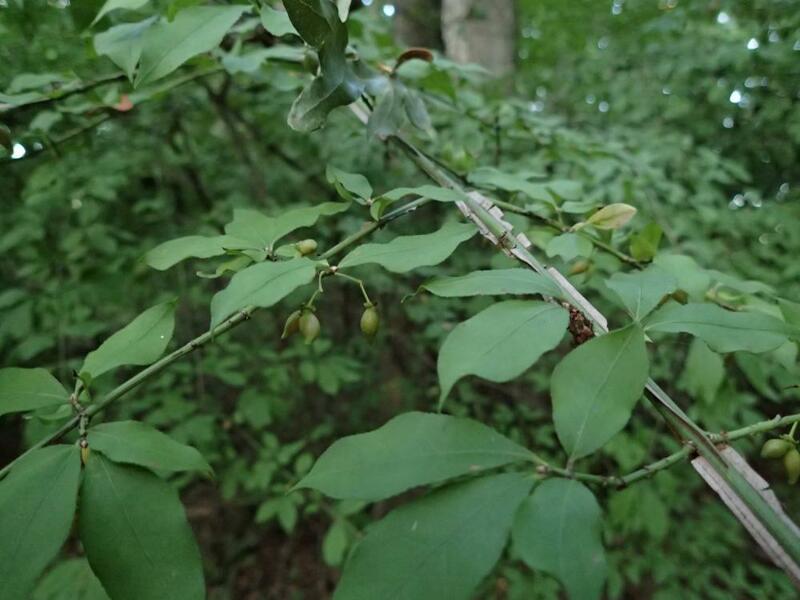 In dense forest shade, black haw flowers and fruits very sparsely, if at all. 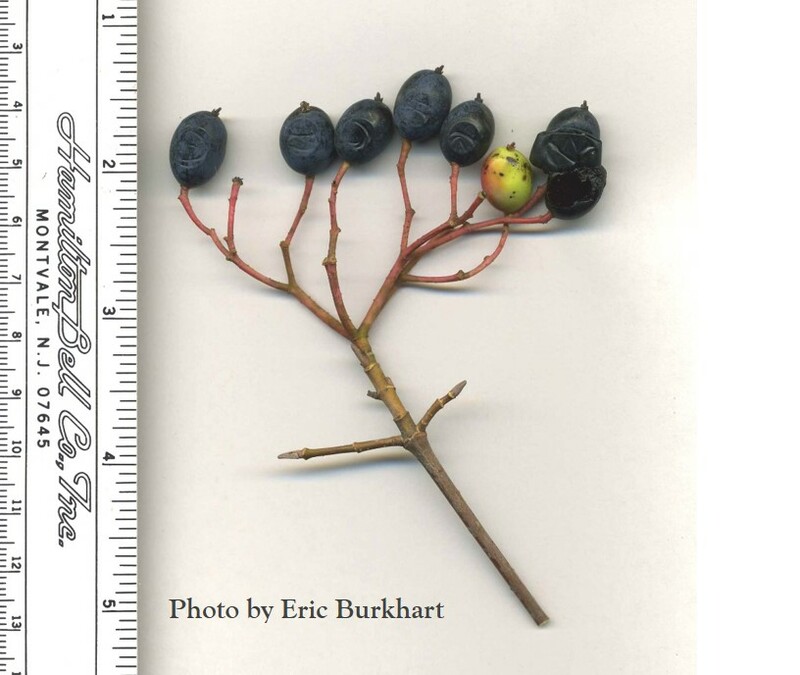 Black haw (Viburnum prunifolium) bark. 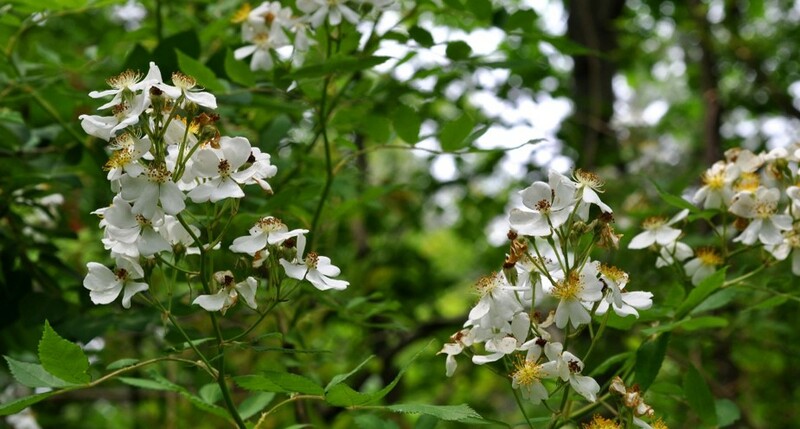 Black haw is also sometimes confused with flowering dogwood because of the alligator-like bark. 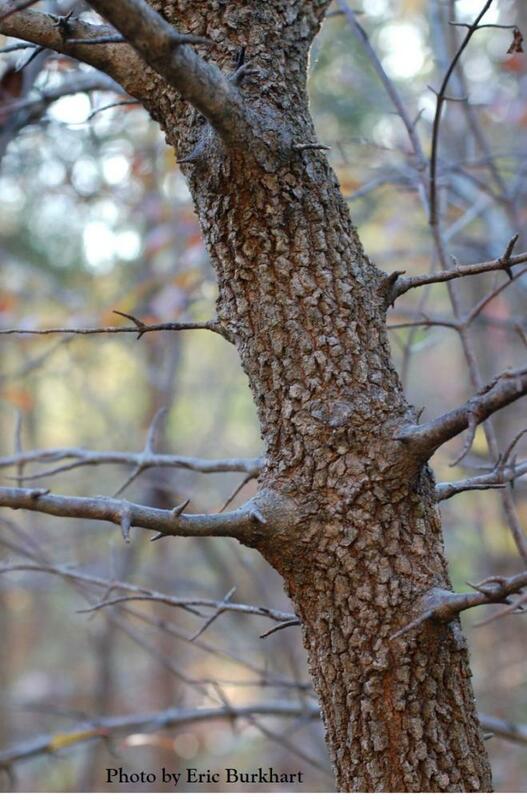 However, the branching of backhaw looks messier, and they tend to retain the base of opposite branches that resemble thorns a bit.